“Mr. 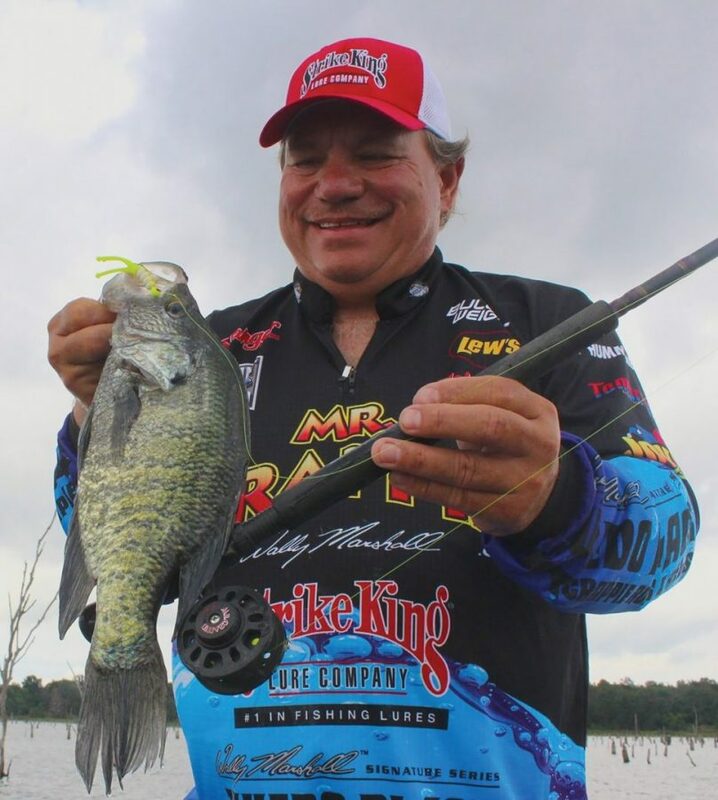 Crappie” is the perfect nickname for Wally Marshall. Yes, he has his own line of top-selling crappie fishing videos, a television show and dozens of crappie-related fishing products to his name. The man lives, eats and breathes crappie fishing. “It’s what I do,” he said. A couple of years back at Lake Fork Lodge, I spoke with Marshall. I had known him for a number of years, but we had never fished together so he invited me out to remedy that and allow me to tap into his knowledge of crappie. As we idled into a cove loaded with timber, Marshall said that anglers could spend hours trying to find fish without electronics. “You really won’t have an impact on fishing unless you know how to use electronics,” he said. “It is important for any kind of fishing, but to consistently locate crappies, it is crucial. Marshall said the spot we were fishing was a brush pile that stretched between two trees. “What we’re going to be fishing with is a jig I have out through Strike King called The Joker,” he said. “It has incredible action and really lures in the crappie.” We fished these lures with six-pound test line on long fly-style poles Marshall has out through Lew’s. “Throw right there,” he said pointing to the corner of a tree. A keeper black crappie hit my line. Then a few seconds later Marshall had one on. “Yesterday it was all whites,” he said. As soon as the sun came out the bite turned on, I caught a two-pound white crappie. A few minutes later, Marshall did the same thing. “I told you there are some big fish here,” he said. Marshall said Lake Lavon is “bar none” the best crappie fishery in the state right now, but that he just returned from a 100-fish day on Rayburn and that Lake Fork is real sleeper for slabs. “This lake not only produces big bass but also big crappie and lots of them,” he said. My time with Marshall reminded me how underappreciated the “intelligence” of crappie is among anglers, and my own experience showed me just how tuned-in Mr. Crappie is to these great fish. 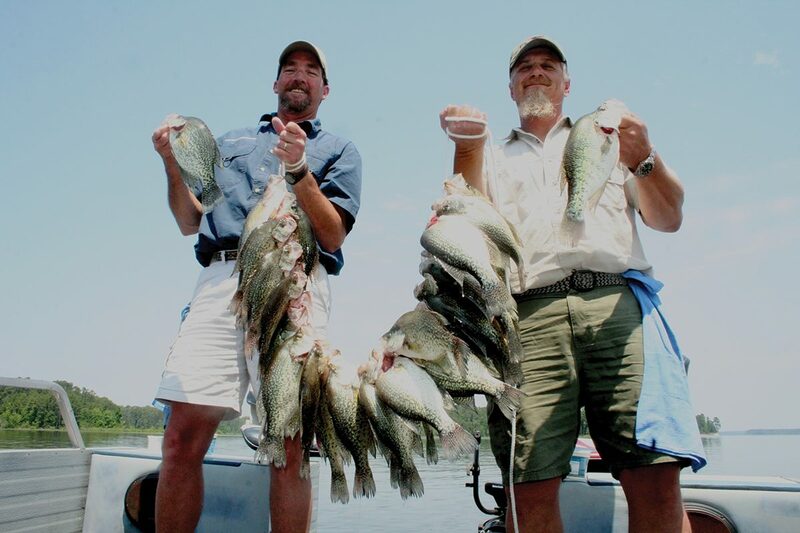 Guides Roger Bacon and Ronnie Burnett with a huge strap of crappie caught on Sam Rayburn. Back in 2005, I had the amazing opportunity to dive with and hand-feed “Splash,” the 121-pound blue catfish caught by angler Cody Mullenix on Lake Texoma. The fish was brought in alive and housed at the Texas Freshwater Fisheries Center in Athens. My goal for the dive was to establish the perspective of a diver encountering a catfish of record proportions for an article I was doing about the legends of giant catfish below dams. Before the dive, the dive master handed me a mesh bag with a few koi and a rainbow trout to feed “Splash” and another full of shiners and crickets to feed the bass and perch. After achieving the goal of hand-feeding the giant catfish and having someone photograph to show the scale of such a huge catfish and a grown man, I took a few minutes to feed the other fish. My eyes were immediately drawn to a massive crappie in the tank. The fish had to be every bit of three pounds, and as soon as I broke out the food, it started my direction. I held out a shiner toward it and was amazed as the fish slowly swam up to it, stopped and then blew a hard jet of water over my shiner (and my fingers) a second or two before lunging forward and inhaling it. After catching a few of these super-sized slabs on Sam Rayburn, it did not take long to connect the dots between my diving experience and the bites of these big fish. These trophy crappies, in my opinion, were either testing or shocking the bait before the strike. My fishing guide friend Roger Bacon often feeds the crappie a little line by peeling it off the spool of his Falcon spinning reel. He then sets the hook when he thinks it is a big one.